Q- How can I afford your services when I’m already in debt? A- Here at TFF we understand that every client has a unique situation. Before moving forward, we design a program to fit your budget. Many clients are even making program payments which are lower than their scheduled minimum payments! Q- How will the debt settlement process affect my credit? The debt settlement process is designed to aggressively reduce your outstanding debts, thereby improving your debt to income ratio. However, it’s likely that if you’re thinking about debt settlement your credit is likely damaged. This could have resulted because of having too much debt, credit card balances that are over the credit limit, or late payments. It is much easier to improve your credit after eliminating your debt than to struggle for many years and then focus on the repair of your credit. Q- Can you lower my interest rates? A- We are not in the business of negotiating interest rates. TFF’s program goes beyond interest rates. We are negotiating on the principal balance owed. Because you’re paying back less, program lengths are shorter and more money can be saved. Q-What types of debt can I include in your program? A- We are able to negotiate unsecured debts such as: credit cards, medical bills, gas cards, overdue rent, repossessions and personal loans. Q-What is the difference between unsecured and secured debt? Unsecured debt is non-collateralized. Simply stated there is no property backing the loan. Such debt can consist of credit card, commercial debt, deficiency balances, medical debt, and personal loans. Secured debt is another type of debt, which is collateralized; basically, it has a connection to some personal property, such as a home or an automobile. When you fall behind the creditor can repossess the property that secured the debt. In many cases the repossessed property will be auctioned. The consumer will then be liable for a deficiency balance – the sum owed after the property is sold. Here at TFF we negotiate your unsecured debt. Q- Can I continue to use my credit cards after enrolling in your debt settlement program? A- The use of credit cards during our program is frowned upon. Racking up more debt going through our program is self-defeating. Charging up credit card debts can quickly threaten your financial goal to live a debt free life. Q- Can I use a debit card during the course of the program? A- Yes. Here at TFF we encourage clients to use debit cards. It encourages financial responsibility. Spending money that you have is more prudent than burying yourself with unsecured debt. In fact, many clients choose to use a debit card during our program. Q- How long do your programs typically last? A- Generally our clients are completing the program within a span of 18-36 months. Q- Are there any pre-payment penalties? A- There are no pre-payment penalties. A- Bankruptcy should be the very last option. A few years ago people could file bankruptcy and walk away from their debts. However, the new bankruptcy laws make it very difficult. In many cases, bankruptcy requires repayment, as determined by the court system. Assets such as a home or automobile can be liquidated. Repayment can last up to 5 years and bankruptcy can last on a credit report for up to 10 years. Q-How do I know that debt negotiation is for me? Barely making the minimum payments? 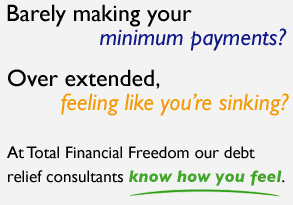 Falling behind with your minimum payments? Stuck with exorbitant interest rates? Using credit cards just to “get by,” such as charging gas, groceries, utilities, etc…? Q- How much does a consultation cost?